On Call Central replaces your answering service with a flat-rate, fully automated system that eliminates operator error, protects provider contact information, and produces permanent audio documentation of urgent patient phone calls. On Call Central’s iOS and Android apps allow you to listen to messages, confidentially return calls, and manage your call schedule directly from your mobile device. On Call Central eliminates operator error. Our servers pick up the phone as soon as we receive a phone call. You get to set your call schedule and determine how providers are notified. On Call Central automatically follows up with providers to ensure they receive urgent message. 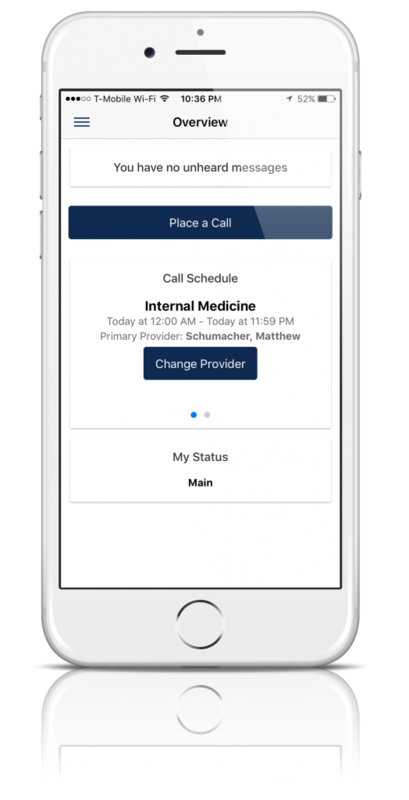 On Call Central features convenient iOS and Android applications that allow you to retrieve messages, return calls, manage your call schedule, and set how you want to be notified, all from your mobile device. A simple drag and drop interface lets you set call schedules months in advance. Create a weekly template, and then simply drag providers onto the correct time slot. Easily create one time exceptions to accommodate last minute changes. Manage all of this from the convenient mobile app. Medically untrained operators are a leading source of error in the management of after-hours calls. Automate for a faster, more reliable experience. On Call Central automatically maintains permanent recordings of all patient messages, and can be configured to automatically record all calls between patients and providers. We log every message, every notification to a provider, and every call back, so you have detailed insights regarding the disposition of each call. When providers return patient calls, On Call Central replaces the provider’s caller ID with your practice’s caller ID. No need to block caller ID each time you return a patient’s call. On Call Central is used by medical practices of every size, and in virtually every specialty, throughout the United States. On Call Central permanently documents and records all patient calls, notifications to providers, and provider return calls. You get complete visibility about what happened and when. On Call Central is 100% automated. We help you establish standardized protocols so that when your patients leave messages, our software notifies the correct on call provider according to the notification sequence you have established. On Call Central charges a simple flat rate per provider. We have no long term contracts and you can cancel at any time. "As soon as I heard what On Call Central offered, I knew we had to have it." "On Call Central has been an indispensable part of our call management protocol for many years. We love it."